NSW farmer Richard Rice is typical of thousands of others across Australia who have put their businesses into survival mode. The family’s mixed farming operation near Parkes in the state’s central west is doing everything it can to cut costs. They scaled back this year’s cropping program because of dry conditions and are wary of throwing good money after bad on paddocks that were seeded. Wheat and canola crops planted earlier this year germinated, but that is about all because of a lack of rain. National Farmers’ Federation chief executive Tony Mahar has warned the drought will be felt throughout the agriculture supply chain. 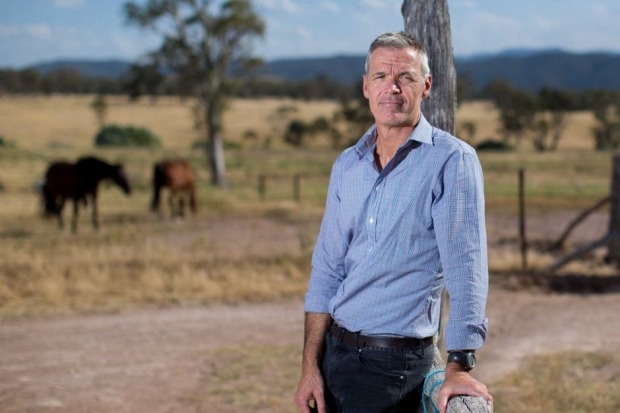 Mr Rice said his farm was far from the worst affected in NSW, where in parts of the state “you would think it was mid-February, not the middle of July”. Mr Rice has slashed spending on chemicals by two-thirds, not even bothering to spray some paddocks, and is making other savings wherever possible in a sign of how drought is felt throughout the supply chain. Farm chemicals and seed supplier Nufarm underlined the knock-on effect this week with a second downgrade since May based on a drought-related collapse in sales. Nufarm chief executive Greg Hunt warned the entire agricultural supply chain was feeling the impact of extremely dry conditions. Elders and Ruralco have warned over flat earnings in their rural service businesses and agencies scattered across Australia. GrainCorp is braced for another small harvest based on a lack of rain across most of the eastern grain belt and has noted “serious challenges” for farmers. National Farmers’ Federation chief executive Tony Mahar said the pain would be felt by farmers, ASX-listed companies and everyone in between. “Farms are right at the base of the value chain,” he said. “There is a huge flow-on effect in rural communities and right through the supply chain and into cities in terms of cost increases and shortages. The NFF has called for both immediate and long-term assistance measures for farmers with almost 100 per cent of NSW under strain from low rainfall and more than 55 per cent of Queensland declared drought affected. Mr Mahar said livestock producers faced the dilemma of whether to de-stock or to buy in feed at higher prices until there was a turnaround in seasonal conditions. “Livestock producers are starting to sell off stock. They might have got good prices a few months ago but as they [sheep, cattle] deteriorate, prices come down. It also impacts their breeding stock for next few years,” he said. “Farmers have sown winter crops that are not up out of ground or, if are they are, are not taking off. “Droughts are regular and people know they are coming, but you don’t know how bad they are going to be. Bureau of Meteorology figures show most of Australia’s grain belt experienced below-average to lowest-on-record rainfall from April 1 to June 30. Rainfall deficiency figures indicate that vast areas of Queensland, NSW, South Australia and parts of Victoria are in the grip of the driest conditions in two decades. There is little relief in sight. BOM is forecasting a dry spring and has issued an El Nino watch alert, which carries with it the risk of lower rainfall. In June, federal government forecaster ABARES said warned of a drop in winter crop production to 37.7 million tonnes. The forecast contrasts with record crop production of 56.7 million tonnes in 2016 and an average crop of 40-45 million tonnes. ABARES forecast wheat production of 21.9 million tonnes, barley production of 9.2 million tonnes and canola production of 3.1 million tonnes. Chickpea production is forecast to fall 40 per cent year-on-year to 616,000 tonnes. GrainGrowers chief executive David McKeon said seasonal conditions across most of Australia had continued to deteriorate since the ABARES forecasts, particularly across the eastern states. Mr McKeon said the seasonal outlook pointed to ongoing difficulties and suggested a clear downside in winter crop production. The upside has been a turnaround for growers in parts of South Australia and most of the West Australian wheatbelt after a poor start to the year. Fears about crop production in the eastern states have seen Australian grain prices surge by about $30 a tonne this month. GrainGrowers said that unless there was a sudden improvement, supply would again by very tight in Queensland and northern NSW where livestock producers have been forced to pay record prices for grain and cart hay huge distances to feed stock. Mr McKeon said a much smaller crop was expected across the east coast after a dry autumn followed by disappointing winter rainfall. “In Queensland and NSW planting is down significantly. In the absence of season breaking rains, many farmers made the decision either to change what they had planned on planting or to not plant at all,” he said. Mr McKeon said the impact would be reflected in lower fertiliser, chemical and machinery sales. It would also hit all businesses servicing farmers from consultants to transport operators. “What a season like this demonstrates is that the impact of drought isn’t just felt at the farm gate, but right through every rural community and right throughout supply chains,” he said. Mr Mahar said a significant number of farmers had built up resilience on the back of strong prices and reasonable seasons in recent years as highlighted by the Farm Management Deposit (FMD) scheme cracking the $6 billion mark last year. The scheme allows farmers to remove money from their taxable income during good years for use in tough times up to a maximum of $800,000. Agriculture Minister David Littleproud said on Tuesday that other lenders should follow Rural Bank and NAB in allowing farmers to offset the deposits against their loans. Mr Rice said the wool price had been a saving grace for his family along with what turned out to be a fortuitous decision to stockpile hay and silage. BOM figures show Parkes had its lowest ever winter rainfall last year which, combined with frost, wiped out many crops. The rain that did fall last year came at the wrong time, with big downpours in February and November too early or late for grain production. “We are saving money wherever we can,” Mr Rice said. “We’re lucky that we had the opportunity in 2016 to put aside hay and silage. “It was a tough time when we had to hand feed ewes all the way up to lambing but we’re a bit further ahead than guys in other parts of NSW.